In my current position I'm responsible for mobile augmented reality development at Diotasoft, in particular the project Selltic. Selltic Augmented Reality Renault Clio 4 Tech Reel from diotasoft on Vimeo. Interactive 3D configurator that allows users to easily create a 3D model of their kitchen. 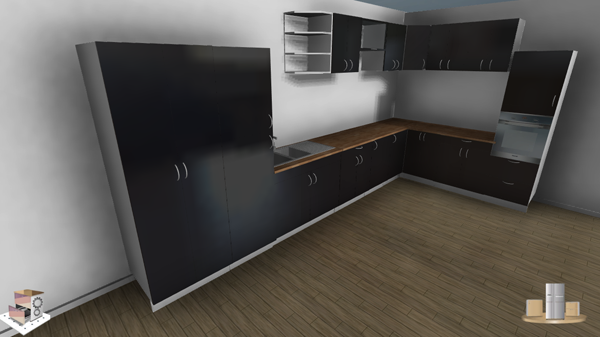 It provides multi-touch interfaces that facilitates user interaction while assembling the kitchen. 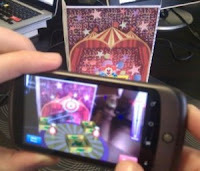 Development of various mobile augmented reality applications using the Qualcomm Augmented Reality Toolkit and Unity3D. LiquiDroid is a fun application that lets you easily morph and warp the faces of your friends. 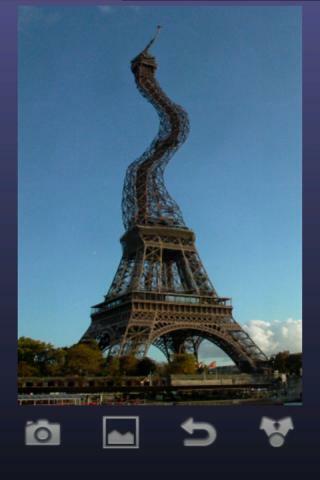 It's really simple: Just take or load a picture, liquify it as you wish by dragging parts around with your finger and share them with your friends by MMS, email, facebook or twitter. 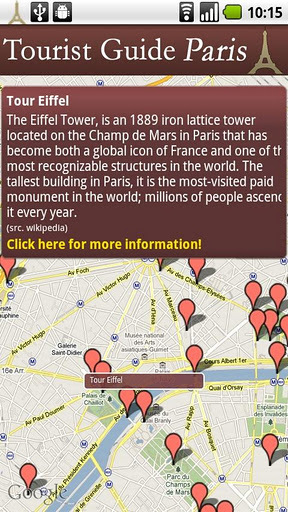 The Tourist Guide Paris is a travel application that helps you find the most popular sights, museums and parks of Paris, like the Eiffel Tower, the Louvre or the Champs Elysee. It alerts you, when you are nearby a sight, provides you with detailed information and can show you directions to any available attraction. 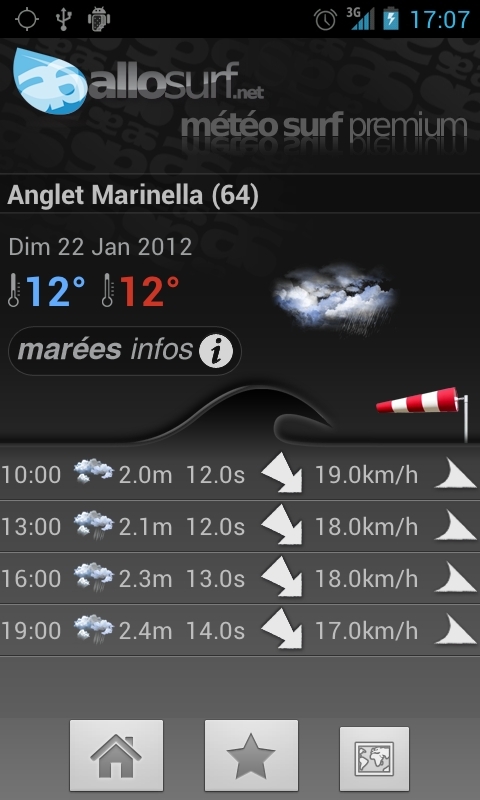 Visualizes weather information, like temperature, sun, rain, wind, wave heights, etc. 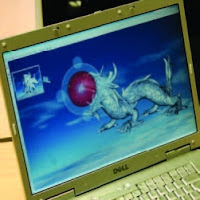 Includes backoffice connection to synchronize personalized user information, like taken photographs or local weather information. 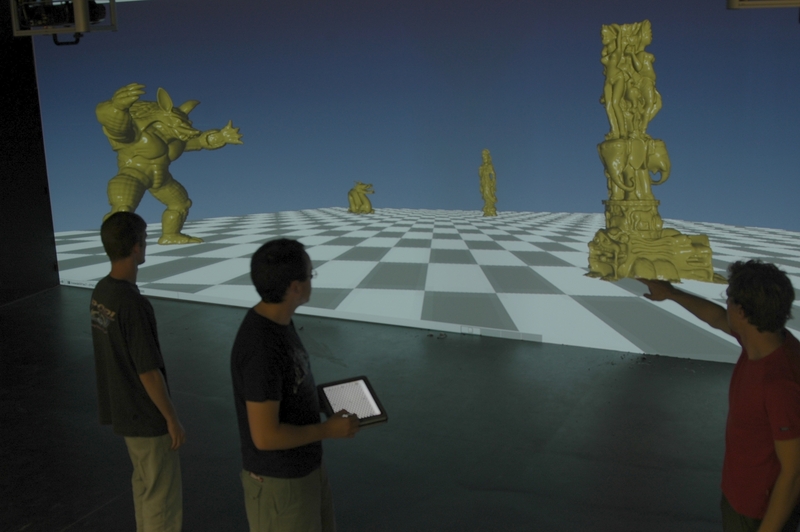 Our research concerns the investigation of new approaches that enhance 3D exploration in virtual environments for users. Thereby, we concentrate on design of novel transversal 3D interaction techniques that are simple, efficient and benefit from new input technology, like tactile interfaces. Our approach allows users to perform complex 3D interaction using single and multiple 2D touch input. 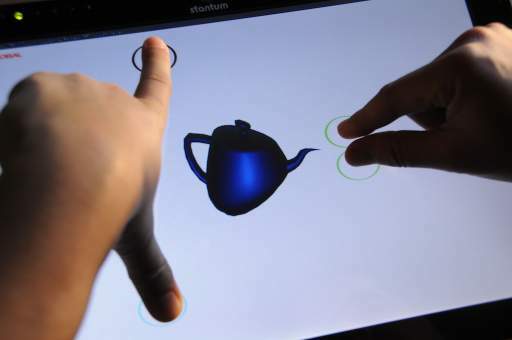 Users carry out simple touch, stroke or sketch-based gestures to interact with content. To draw conclusions about the usability of our interfaces we evaluate the interaction techniques by conducting users studies. 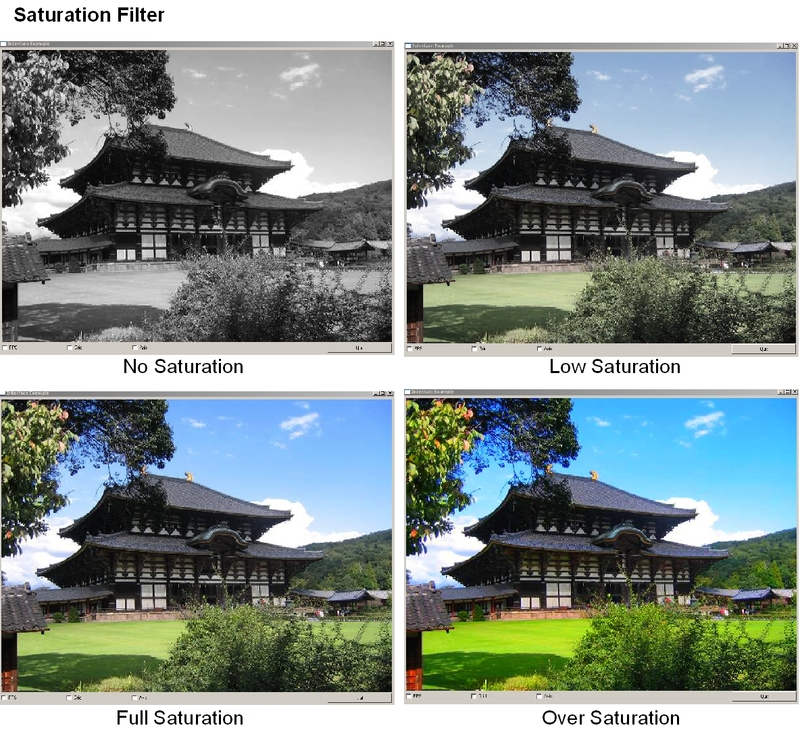 In addition, we adopt different traditional and illustrative visualization techniques to highlight object characteristics in focus while preserving context information. 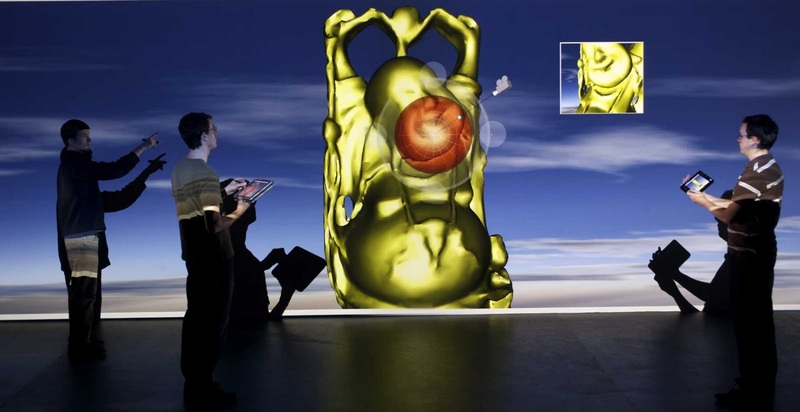 Furthermore, we propose new methods for collaboration between users, who interact together with 3D data using varying technology, from small mobile devices to immersive virtual environments. 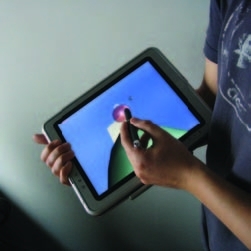 Recent years have known a keen interest for tactile surfaces that are capable ofdetecting multiple touch input, like the IPhone, the Stantum tablet sized device,the Microsoft Surface interactive table or the tactile wall from Perceptive Pixel.Therefore, the research community and commercial developer became highly interested ininvestigating interaction techniques that benefit particularly from multitouch systems. Suchtactile interfaces lead to a (r)evolution of usage for interaction with digital content in oureveryday lives. This technology became available to a wider audience especially on mobiledevices but also on public large screen installations. 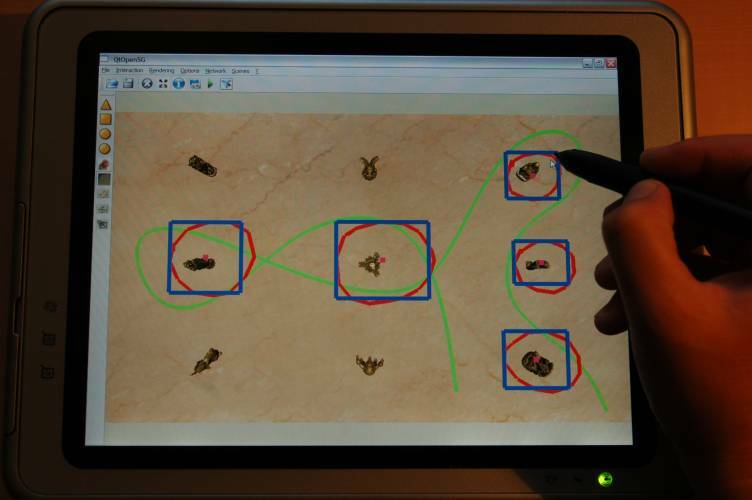 Numerous examples have shownthe benefit of multitouch approaches for interaction with 2D content such as with photosor maps. In particular, the two-dimensional congruence of multitouch sensors and manipulated2D data leads to a very direct interaction. 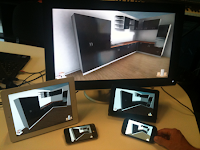 On the other hand, few works have exploredthe potential of multitouch interfaces for interactive 3D applications. By identifying goodmappings between users’ movements and resulting actions in the 3D environments, we areconvinced that multitouch approaches have a great potential for interaction with 3D content.In order to benefit from the power of interactive 3D environments, and to understandthe spatial structure of the manipulated data, users of 3D applications need to manipulateseveral degrees-of-freedom (DOF). With current 2D mono-point input devices, this requires users to switch between different control modes (e.g. translation, rotation, and scale), whereonly 2DOF can be controlled at the same time. This leads to the separation of 3D interactiontasks into subtasks of interactions. Each control switch dividesthe action in separate chunks, because the applied motor tension changes and the motioncontinuity is interrupted. 3D input devices have been developed to better adapt the inputsystem to the structure of the 3D tasks. Unfortunately, these devices are generally restricted to dedicated contexts; they have not been broadly adopted by the general public. 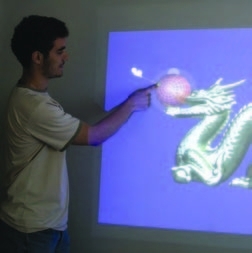 On theother hand, multitouch technologies are becoming more and more popular, thus open newperspectives for interaction with 3D data. 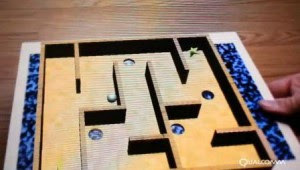 We explore a new approach to address this challenge.In particular, we describe an interaction technique for manipulation of 3D objects, and we study the usability of such an interface compared to a standard 2D multitouch approach. individual cutaway views to focus on hidden objects. At the same time, important contextual information is emphasized by illustrative rendering techniques. Navidget is a new interaction technique for camera positioning in 3D environments. Unlike the existing POI techniques, Navidget does not attempt to automatically estimate where and how the user wants to move. Instead, it provides good feedback and control for fast and easy interactive camera positioning. 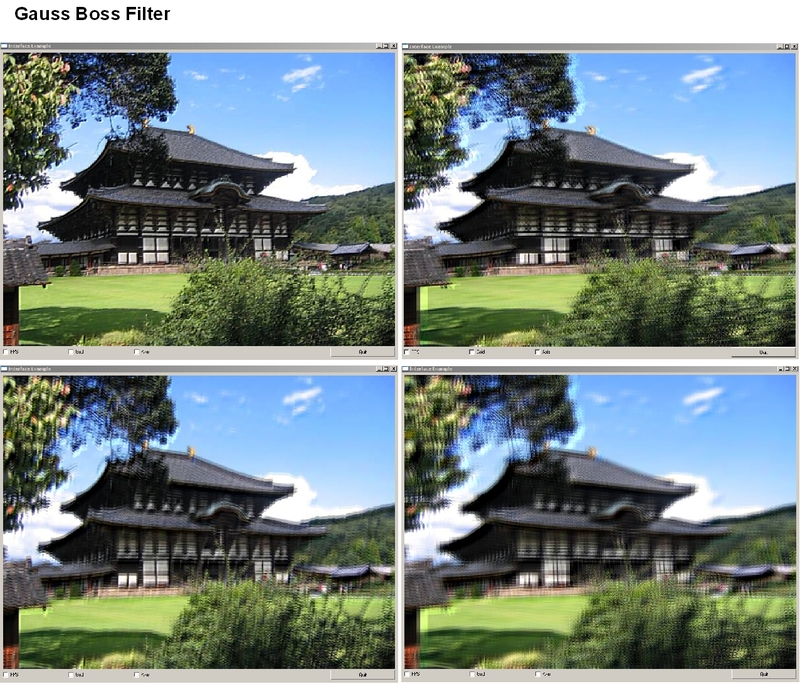 Navidget can also be useful for distant inspection when used with a preview window. This new 3D User interface is totally based on 2D inputs. As a result, it is appropriate for a wide variety of visualization systems, from small handheld devices to large interactive displays. A user study on TabletPC shows that the usability of Navidget is very good for both expert and novice users. Apart from these tasks, the Navidget approach can be useful for further purposes such as collaborative work and animation. 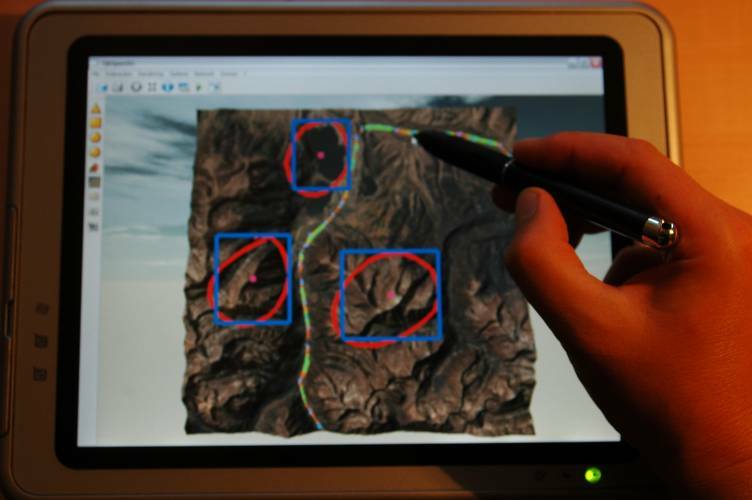 We present a novel sketch-based route planning technique, that supports the collaborative work of a group of people navigating through a virtual environments using mobile devices. With our new approach, route planning tasks, like creating camera animation paths, can be generated very efficient, while working on large screens with complex data. Our interaction technique lets the user explore the distributed environment in a two stage process. 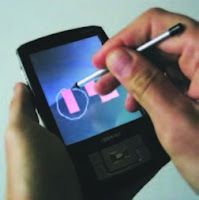 During the first stage, the user draws the preferred navigation path directly onto a touch sensitive mobile device, that presents the data as a “World in Miniature”. 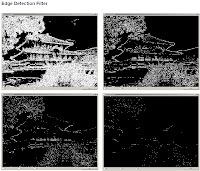 Afterward, during a second stage, the user can define areas of interest by performing additional sketches, like drawing points, lines or circles, to easily define the camera orientation during the animation. Based on the sketched input, the system creates automatically the optimal animation path and camera orientation, so that disturbing occlusions are avoided and all areas of interest are in view. 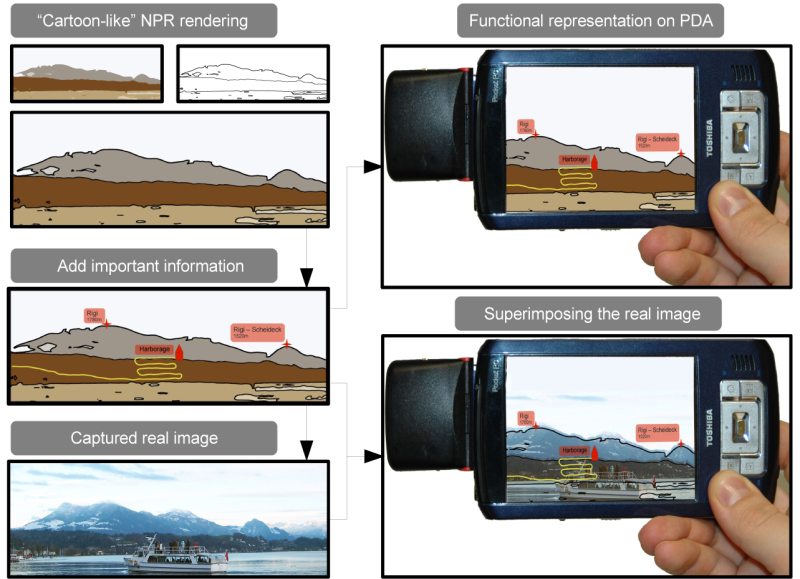 In this paper, we present a prototype for an interactive 3D panorama service. Such a service can be considered as the core of a digital assistant for mobile users like hikers and tourists. In particular, our service is based on geographical web services and non-photorealistic rendering of 3D terrains. 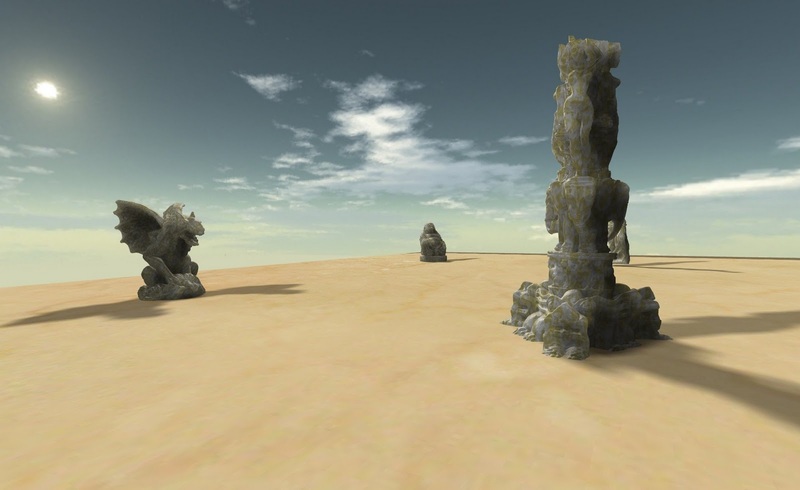 The result is a light X3D scene which can be viewed with any X3D compliant browsers. 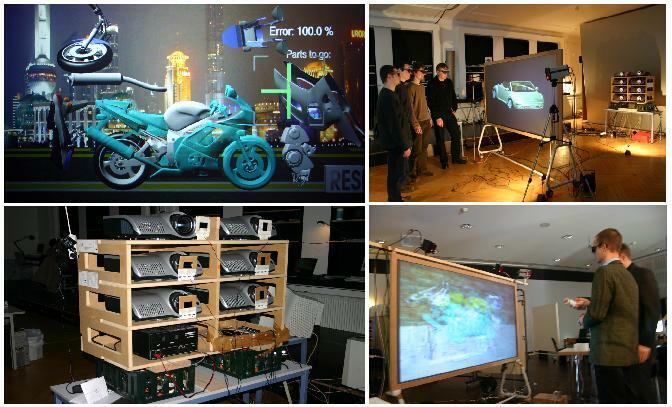 Interactive 3D graphics have shown undeniable benefits and are now standing as ineluctable medium in many application domains. Mainly dedicated to desktop monitors for a long time, the visualization of the 3D environments has evolved in new directions. 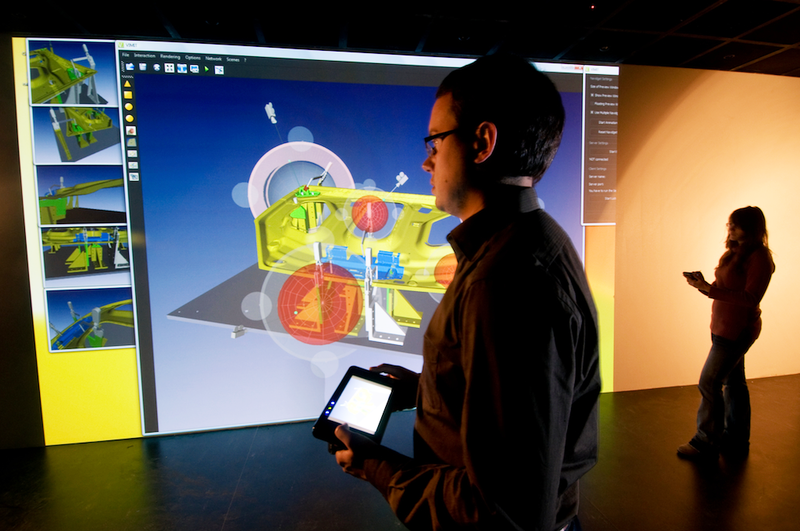 On the one hand, in the past few years, immersive projection technologies have been developed to favor immersion of users, and to enhance collaboration in groups’ applications. On the other hand and more recently, the evolution of mobile technologies has laid to the development of new 3D mobile applications on cell phones or PDAs. We propose to investigate the merging of these two technologies. In particular, we want to enhance interaction between mobile users that are surrounded by the real environment and distant “control centres” where high quality visualizations are provided. On the one hand, information such as GPS positions and video streams can be received by control centres from all the mobile units. On the other hand, control centres that have a global knowledge of the situation can send helpful information to the mobile users, such as 3D models of pertinent objects. The interest of such kind of approach can easily be understood for many applications in the scope of crisis management or distant assistance. Numerous challenges have to be solved for the success of such new technologies: i) technical issues have to be considered for the development of an operational framework - ii) investigations have to be conducted in order to propose adapted visual representations and efficient interaction techniques. We will jointly concentrate on both these technological and human factor challenges. Improvement of initial values for better numerical convergence of Newton iteration in the context of raycasting of parametric surfaces on modern graphics hardware using Lightfields and uniform voxel grids. Generic system was developed that generates individual shaders for geometric primitives, which share common traits, inside of a scenegraph. It uses extensively the Sh (High Level Shader Language), which allows the use of C++ paradigms while designing the shader framework. This leads to the possibility of creating shaders though "Shader Algebra". Different Shaders (HDR, Cook Torrance, Blinn Phong, Satin, Bump Mapping, Wood, Gooch, Toon etc.) 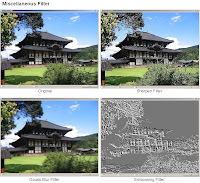 are created using shader algebra depending on material properties which are provided by the scenegraphs. 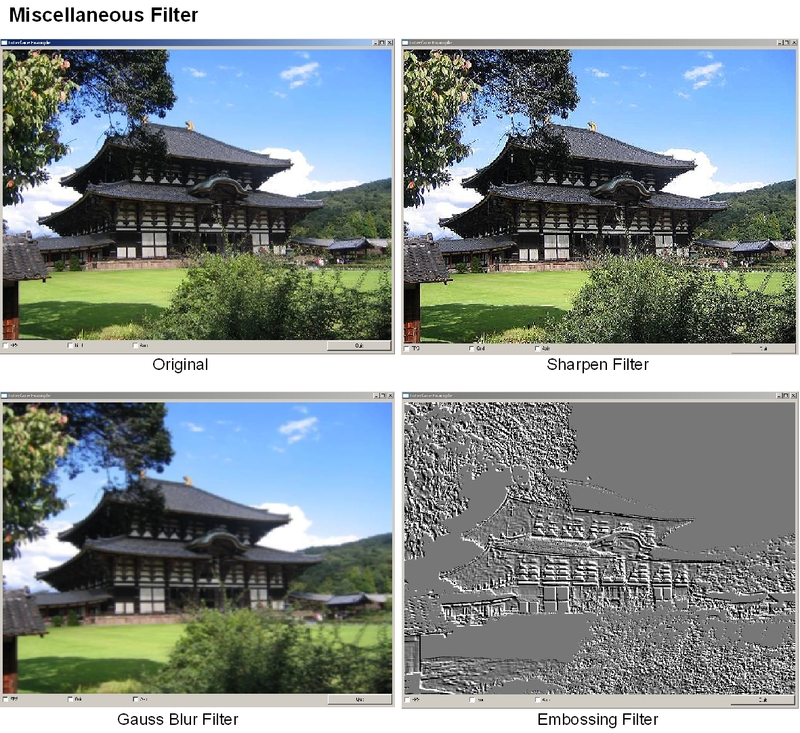 GPUShop is an High performance image processing framework that provides a lot of different Filters to process arbitrary images. The whole computation is performed though shaders on the GPU which leads to high performance. 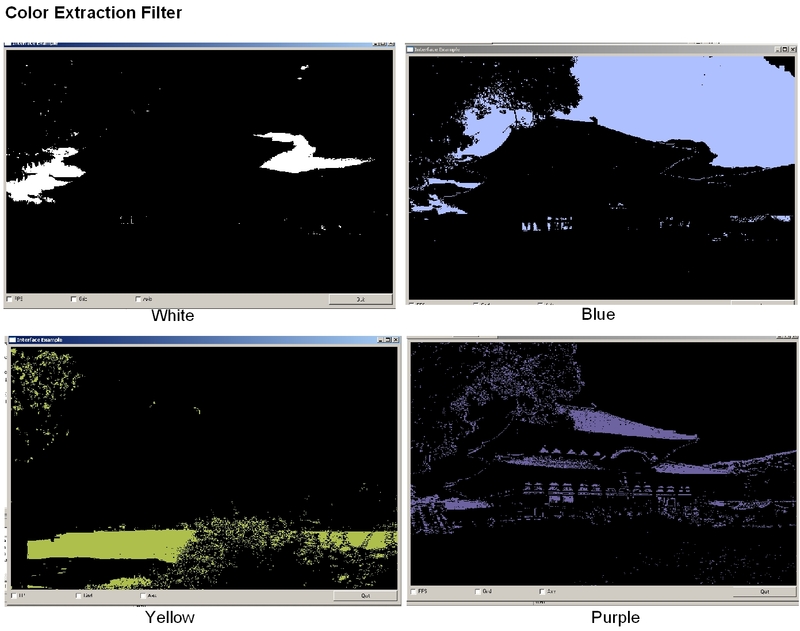 Thus it allows the use of multiple complex filters on image streams captured from a camera in real-time. 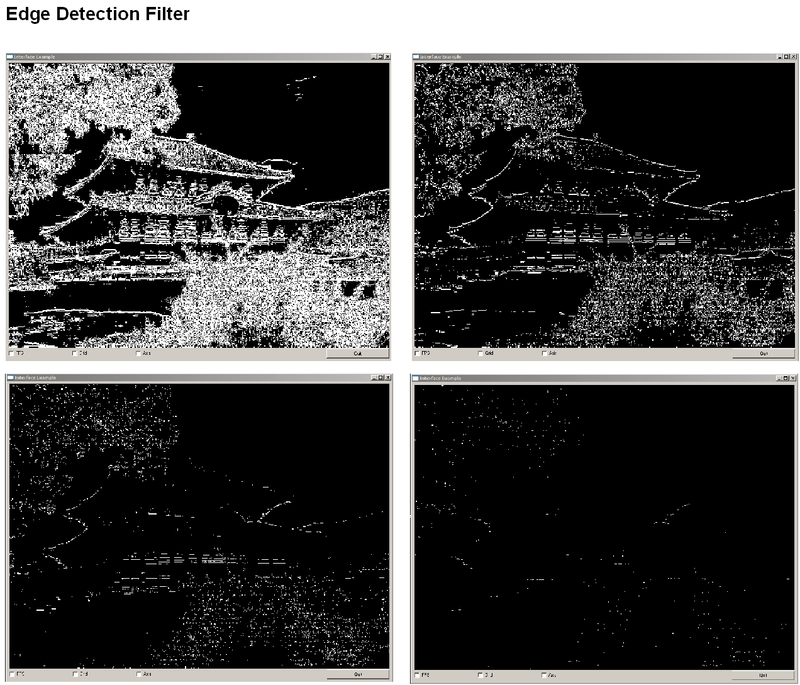 Different shading languages (Cg, GLSL, Sh) were used to programm the filter kernel. Implementation of streaming application using Java Media Framework. 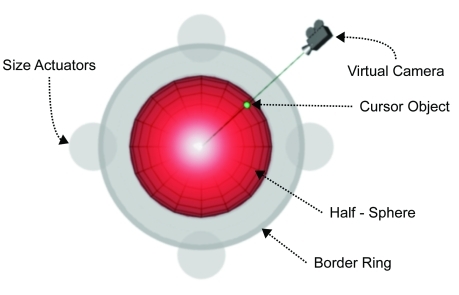 Concept and development of a new Interaction technique, the 3D cursor, for multiple users interacting with a virtual environment. A new 6DOF input device, the GlobeMouse, was also result of the project. 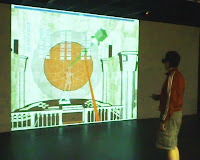 The complete system was presented at the VR 2005 conference in Bonn. Children television productions have been using puppets for a long time. 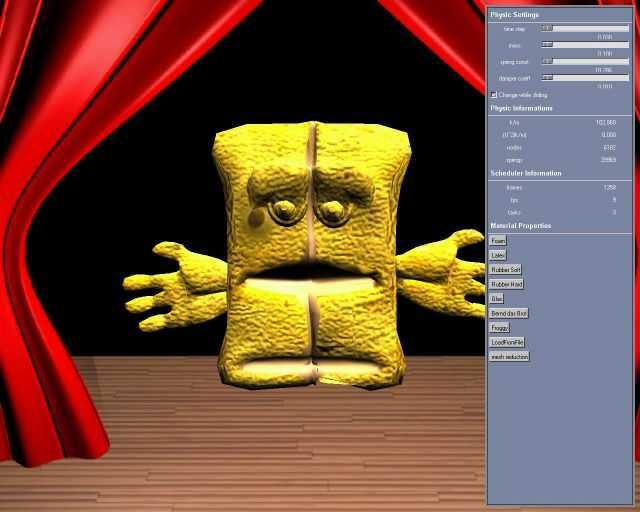 Since the early days of computer animation, computer puppet simulation has been researched intensively. Complex motion capture equipment allows nowadays the real time mapping of movement for virtual puppets (performance animation). However, the costs of capturing equipment are too high and the difference in the workflow make it difficult for small production teams to access and use such technology. 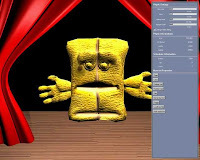 The goal of the project was to develop a system for the real time simulation of elastic latex hand puppets which are used in television productions.After an analysis of the production processes of real puppets and of the materials used for their production, the paper describes the components of the system simulating them. The system connects a high resolution visual mesh to a three-layered 3D mass spring mesh, which is used for the elastic simulation. Polygonal mesh decimation of the puppet surface model is used as a basis for generating the elastic mesh. From the decimated mesh a new metod is proposed for generating the internal layers of the mass-spring mesh. 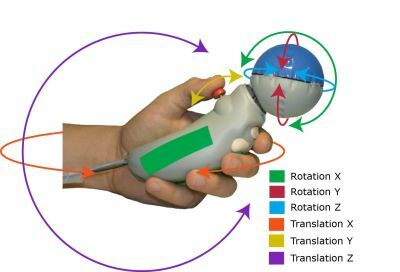 A data handglove is used for transmitting forces to the elastic mesh, indirectly moving the surface of the virtual puppet in real time. Dataglove interaction maps in a natural way the hand movements of a puppeteer to the computer model. The tradeoffs of the implementation on low cost hardware and its efficiency are also discussed. Distributed application for multiple users, providing correct physical simulation of 3D objects inside of a virtual environment. Two multiplayer games were developed as part of the project. 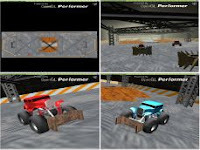 The carrom game was the abstraction of popular board game and fireball was a mixture of a distributed multiplayer car race and football game. Both games provide correct physical simulation. To achieve a consistent lighting situation between real and virtual environments is important for convincing augmented reality (AR) applications. 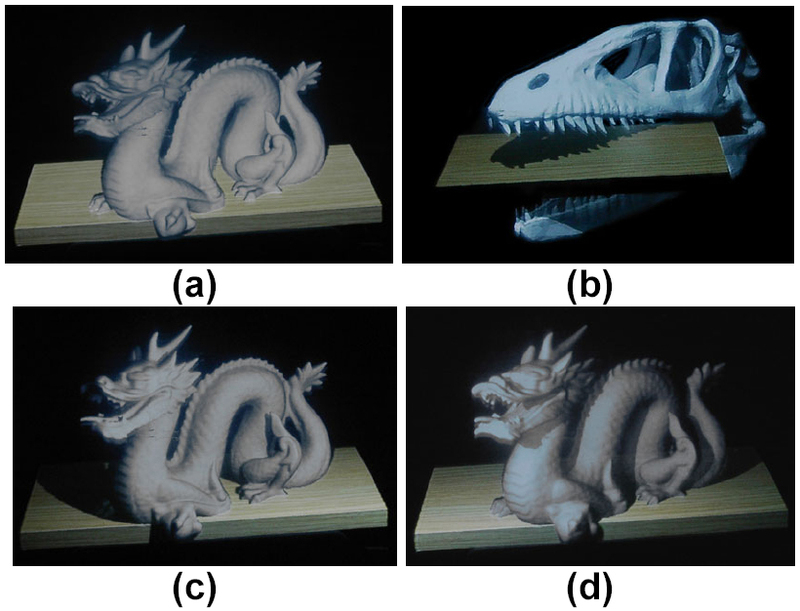 A rich pallet of algorithms and techniques have been developed that match illumination for video- or image-based augmented reality. 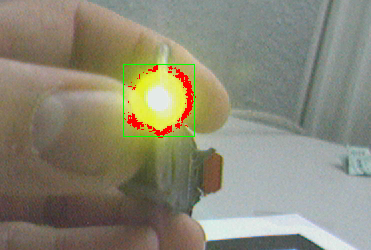 However, very little work has been done in this area for optical see-through AR. We believe that the optical see-through concept is currently the most advanced technological approach to provide an acceptable level of realism and interactivity. Methods have been developed which create a consistent illumination between real and virtual components within an optical see-through environment – such as the Virtual Showcase. 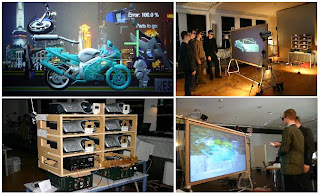 Combinations of video projectors and cameras are applied to capture reflectance information from diffuse real objects and to illuminate them under new synthetic lighting conditions. For diffuse objects, the capturing process can also benefit from hardware acceleration – supporting dynamic update rates. 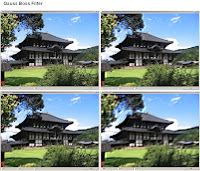 To handle indirect lighting effects (like color bleeding) an off-line radiosity procedure is outlined that consists of multiple rendering passes. For direct lighting effects (such as simple shading, shadows and reflections) hardware accelerated techniques are described which allow to achieve interactive frame rates. 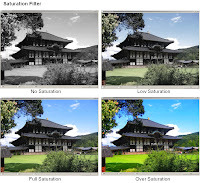 The reflectance information is used in addition to solve a main problem of a previously introduced technique which creates consistent occlusion effects for multiple users within such environments. Tracking of 3D objects using low-cost technologies like fire wire cameras webcams and LightEmiting Diodes (LED).